Chums are not leader-shy and have a vicious strike, so act accordingly. I prefer commercially manufactured tapered leaders in the 9-foot range, but you can build your own if you like. Start out with 3 feet of 30-lb. test connected to 3 feet of 20-lb. test. You can then add an additional 3 feet of 17- to 15-lb. test for your fly connection. When my friend and international fly fishing guide Harry Robertson told me that he was going to Alaska to catch chum salmon, I thought he was pulling my leg. “I’ll admit that I don’t know much about salmon, Harry,” I snorted in derision, “but aren’t chums called ‘dog’ salmon because the Alaskan natives fed them to their sled dogs?” After all, everyone knows that folks travel thousands of miles and drop thousands of dollars to catch kings and silvers—not chums. Harry looked down his nose at me before responding, “You’re right, Beau: You don’t know much about salmon. If you did, you’d know that chums are terrific fighters. Why don’t you come with me and learn a thing or two?” Well, I’m a firm believer in the importance of a good education, so I headed to Alaska with Harry to do a little research. My own experience with the chum has taught me that fly anglers should pay more attention to this feisty fish. When you do battle with chums, prepare to spend a lot of time looking at your backing. One chum will take you along for two or even three long runs. And unlike some other salmon, chums prefer relatively shallow water. You can wade for chums with great success. Finally, though other species of salmon may be turned off by flies, chums strike them with a vengeance. The chum salmon (Oncorhynchus keta) has the largest migratory range of any Pacific Salmon. You’ll find chums from California to Alaska in North America, as well as in such far-flung places as Russia, South Korea, and even Japan. And happily, many rivers that are home to chums don’t even require a boat to navigate. In Oregon, for example, try the Kilchis and the Miami Rivers, which empty into Tillamook Bay. In Washington, try the Nisqually, the Puyallup, and the Skokomish Rivers, which empty into the Puget Sound. In California, try the Sacramento and the San Lorenzo Rivers. And for those Canadian anglers, chums inhabit over 750 rivers in British Columbia. Female chums lay anywhere from 2,000 to 4,000 eggs each, and depending on where they are hatched, these fry either immediately head out to the ocean or spend a few months in the river. Chum will often stage at the bottom of a river system and wait for an incoming tide to help them enter their spawning grounds. They rarely travel more than 100 miles inland to spawn, leading some to believe that chums are incapable of traversing obstacles easily—which might explain why they are currently listed as an endangered species. Most adult chums weigh between 5 and 15 pounds, depending on how long they stay at sea. Some fish will return to spawn at only 3 years of age, whereas others may wait up to 7 years. When migrating from the ocean, chums are the color of chrome, but they begin to take on spawning colors after coming in contact with fresh water. Black, green, and even purple bands run perpendicular to the sides of the fish, a unique characteristic of the spawning chum. Chums tend to travel in schools, though these schools very greatly in size (from as few as 30 fish to as large as a football field). You’ll find chums resting near sand bars if caught by a dropping tide, or you may find them pulled in below a break in the river to stage while waiting to go upstream. Don’t bother looking for chums in deep pools or areas that are sometimes referred to as “frog water.” These areas are perfect for pike and resting silvers, but chums like the openness of moving water and are not likely to be found in what anglers after other species of salmon might consider a good fishing hole. Once you’ve located the school, cast your fly slightly upstream and wait for the current to do most of the work. I’ve found that chums often take flies on the swing, so sometimes a small bump will be followed by a shoulder rattling jolt. Set the hook firmly once you have a strike, and don’t be afraid to set the hook a second time. Once you feel that the hook is set, don’t force the chum to do anything—or you’re likely to break your line. If drifting your fly down and across the school doesn’t get a response, change your tactics to something that you feel more comfortable with. I’ve gone after chums using some of the same tactics that I use with smallmouth bass. Some anglers even used popping bugs with success. The important thing is to take your time and determine how your school wants its flies presented. Don’t wade too far out to chums. The further out into the river you wade, the further you’ll manage to push these fish from you. After all, chums are aggressive, not stupid. If you find yourself more than waist-deep in the water, back up—you’ve gone too far. A range of rods is appropriate for chum salmon fishing, including 5- to 9-weights, depending on the class and size of fish you’re angling over. If limited to only one rod, I would probably choose an 8, which would not overpower smaller chums but would still have the backbone to turn a larger fish. A note of caution: If you do hook a large chum salmon, you will never need to be reminded again to keep your knuckles clear of the reel. Because chums tend to stick to fairly shallow water, go for weight-forward floating lines. I use Airflo’s Polyfuse series because it can withstand the abuse these fish can dish out and because of its high floating characteristics. Check the end of your line frequently because chums sometimes inadvertently dig themselves into the sand bar to avoid being caught, thus tearing up your leader and fraying your line. Migrating chums may not be eating, but their predatory instinct causes them to strike at flies that appear to be fleeing. Flies can be any color you like—as long as it’s pink. 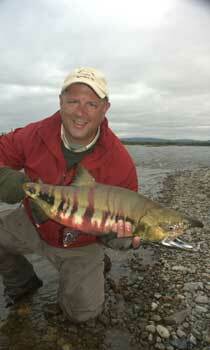 For some reason, chum salmon seem to key in on this one particular color. Other colors may work from time to time, but for some reason chums dig pink. Use hooks in sizes from #4 to 2/0, and don’t forget to bend down your barb. Yes, you read that right—I said bend down that barb, and I meant it, for two reasons: In general, chums are not easily spooked, so you may have several opportunities at these aggressive fish and you don’t want to injure them with a foul hook. Also, your fly line is under a lot of pressure when a chum is at the other end of it, and if your fish gives your hook the slip, that hook may come rocketing back at you. One of my fishing partners in Alaska managed to lodge a # 2 salmon hook in his nose (don’t ask). Fortunately for him, he had bent down the barb earlier. It was fortunate for me, too, as I was the lucky stiff who got to drive the hook the rest of the way through the bridge of his nose before cutting it (the hook, that is) off with a pair of needle-nosed pliers and then baking it out. 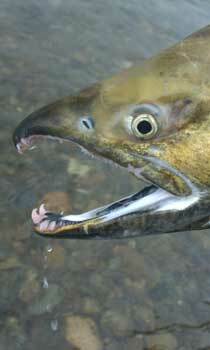 Don’t let the “dog” salmon’s bad press deter you from pursuing these fierce fighters. My own research has shown me that chum salmon get a bum rap: Pound for pound, they just might be the hardest-fighting fish that swim in fresh water. Beau Beasley is an outdoor writer, speaker, and regular contributor to Fly Fish America. He lives with his wife and children in Warrenton, Virginia.